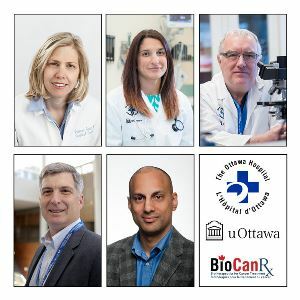 Researchers from The Ottawa Hospital and the University of Ottawa will play a lead role in cutting-edge research on cancer immunotherapy, thanks to five new peer-reviewed research grants from BioCanRx, worth $5.5 million. BioCanRx is a Network of Centres of Excellence funded by the Canadian government and other partners. It is based at The Ottawa Hospital and led by Dr. John Bell. The new funding is part of a package of 16 grants awarded across the country worth $11 million. Immunotherapy makes use of the body’s own immune system to fight cancer. Two of the new projects involve genetically modified immune cells (called CAR-T cells), which have shown great promise in clinical trials in the United States and Europe. CAR-T cells are derived from a patient’s own T cells. While T cells can naturally kill cancer cells on their own, many cancer cells have found ways to deactivate T cells and escape their attack. CAR-T cells are T cells that have been “reactivated” to attack cancer cells through genetic modification. In some cases, CAR-T cells have been able to completely eliminate advanced cancers, particularly in children with blood cancers. However, CAR-T therapy also comes with significant risks and many questions remain. The two CAR-T projects funded by BioCanRx will focus on manufacturing these cells in Canada and developing an evidence-based, patient-centered protocol for the first Canadian clinical trial of this technology. Two additional projects involve using viruses to create personalized vaccines to help the body’s immune system attack cancer. In this approach, cancer cells from a patient would be grown in a lab and then infected with a virus. The virus-infected cells would then be injected back into the same patient. The hope is that these infected cells would stimulate the patient’s own immune system to attack the cancer cells. The researchers hope to optimize this approach in laboratory models of abdominal cancer and blood cancer, in preparation for clinical trials. The final project involves improving the design, analysis and reporting of cancer immunotherapy studies in laboratory models. This will help researchers efficiently and effectively translate their most promising discoveries into clinical trials. These projects are possible because The Ottawa Hospital has state-of-the-art research facilities supported by generous donors. For example, The Ottawa Hospital’s Centre for Innovative Cancer Research, where much of this research is based, was built with $9.5 million from The Ottawa Hospital Foundation. Researchers from Ottawa, Vancouver, Victoria and Montreal will work together to develop the protocols and infrastructure to manufacture the first CAR-T cells in Canada. The goal is to be ready to conduct clinical trials by the end of 2018. The first CAR-T trials in Canada will target blood cancers, but subsequent trials will likely involve other kinds of cancer, as well as CAR-T cells in combination with other therapies, such as cancer-fighting viruses. Researchers from Ottawa, Victoria and Vancouver will create the most evidence-informed early phase clinical trial protocol produced to date. This world-class protocol for CAR-T cells to treat blood cancer will address the concerns raised by earlier CAR-T clinical trials by ensuring the eventual trial is feasible, safe, effective and economical. The team will review previous studies of CAR-T cells and consult with patients and physicians on their preferences for a clinical trial. Researchers from Ottawa and Hamilton aim to use viruses to develop a personalized vaccine to fight the spread of abdominal cancer. The goal would be to grow a patient’s own cancer cells in the lab, and then infect them with a virus. The virus-infected cells would then be injected back into the same patient. The team has previously found that this kind of vaccine can eradicate large tumours in laboratory models of colon cancer. They will now be able to optimize the approach to prepare for human clinical trials. Researchers from Ottawa and Hamilton aim to use viruses to develop a personalized vaccine to treat leukemia patients who have not responded to conventional treatments. The goal would be to grow a patient’s own cancer cells in the lab, and then infect them with a cancer-killing virus. The virus-infected cells would then be injected back into the same patient. This funding will help these researchers move their findings closer to clinical trials. Researchers from Ottawa, Montreal and Hamilton will help cancer biotherapeutics researchers improve the design, analysis and reporting of their preclinical studies, so that results can be more efficiently and effectively translated into human clinical trials. The researchers will review the current state of cancer biotherapeutics pre-clinical studies to better understand the attitudes and challenges faced by researchers in this field. Then they will develop a workshop and online resources to teach best practices for pre-clinical trials based on their findings.